The execution took place by a crane pulling them up. Normally it takes several minutes until the death occurs by this method of hanging. Iran Human Rights (IHR); March 19, 2019: A part of the 11th Annual Report on the Death Penalty in Iran, by IHR, deals with public executions in the country. Despite continuous international criticism, Iran is among the few countries where public executions have been organized by the authorities. Public executions have repeatedly been criticized by the UN. Both the UN Secretary-General and the Special Rapporteur on the human rights situation in Iran have expressed concern about the continued practice of public executions in Iran. During Iran’s second UPR, the Government did not accept the recommendations to put an end to public executions. This has also been emphasized in the recent report of the current Special Rapporteur on Human Rights in Iran, Javaid Rehman. In 2008, a judicial moratorium on public executions was adopted by the Iranian authorities. As a consequence, the number of public executions in 2008-2010 was relatively lower than in the previous years. 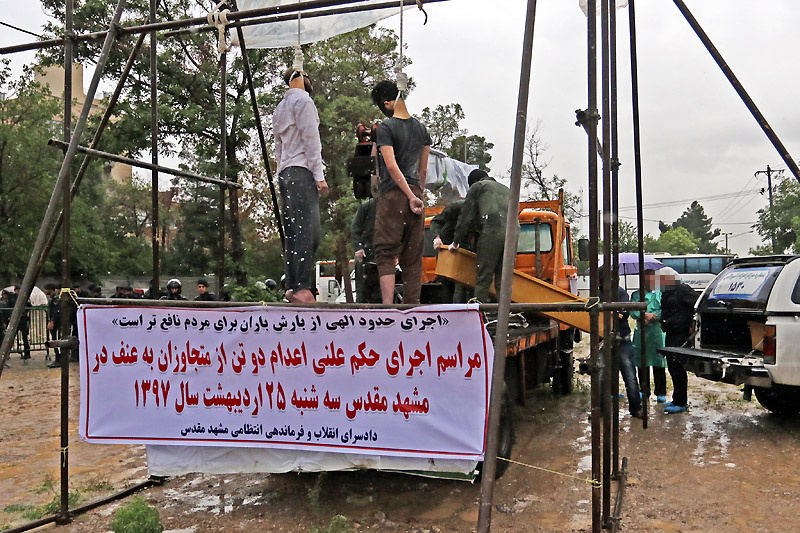 However, after 2010 the number of public executions increased dramatically, reaching an average of 50 to 60 public executions between 2011-2015In 2018, the Iranian authorities executed 13 people in public spaces. This is the lowest number of public executions since 2009 (the year after the moratorium, 9 public executions). Whether there is a political decision behind this reduction remains to be seen. The diagram above shows public executions since 2008. The number of public executions in 2018 was significantly lower than the number in the previous seven years. Whether it is a permanent change or not remains to be seen. In the first half of January 2019, five public executions were implemented in three different Iranian cities. Public executions were conducted in 6 different provinces in 2018, compared to 15 provinces in 2017. 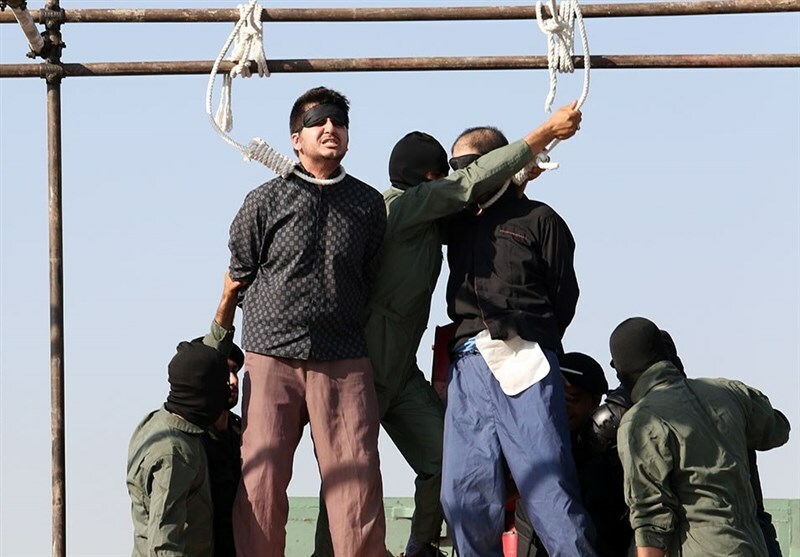 Fars province (Southern Iran) which had topped the public executions between 2010 and 2016, registered one public execution in 2017. In 2018, this province is once again one of the two provinces with the highest number of public executions. In 2015, in response to a joint statement by two of the UN Special Rapporteurs condemning the practice of public executions by the Iranian authorities, the “High Council for Human Rights” of the Iranian Judiciary issued an official statement saying, “public executions take place only in some limited and special circumstances, including incidents which distort public sentiment, to act as a deterrent to decrease the number of drug-related crimes. It should also be noted that the mentioned sentences are provided to avoid the presence of minors at the scene of executions”. However, photos taken from the execution scene in the previous years demonstrate that children are often present at these events. The executions are often announced in advance and take place early in the morning in front of dozens of citizens. In 2018 the Iranian media showed more restriction than before in showing children watching the public executions. However, all the reports, information and testimonies, reveal that in 2018 the executions were carried out in public spaces or in the residential areas in front of a crowd of several hundreds. No reports indicate any specific measure taken by the authorities to limit the presence of children. One of the official reports mentioned that children between 3 and 10 years were present among the crowd. 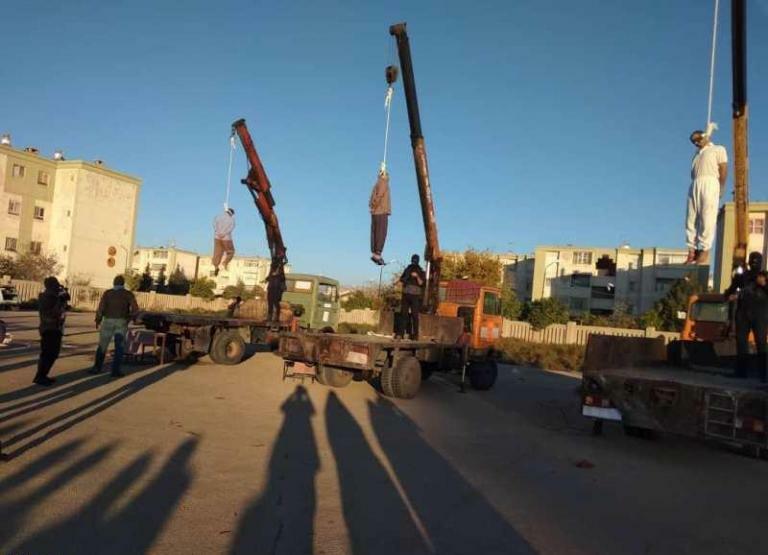 On March 15, 2018, two prisoners were hanged in public in the city of Dogonbadan, the capital of Gachsaran County, Kohgiluyeh and Boyer-Ahmad Province. The prisoners were siblings and were sentenced to death for an armed robbery which resulted in the death of two people. It took less than 100 days from their arrest until they were executed in public. 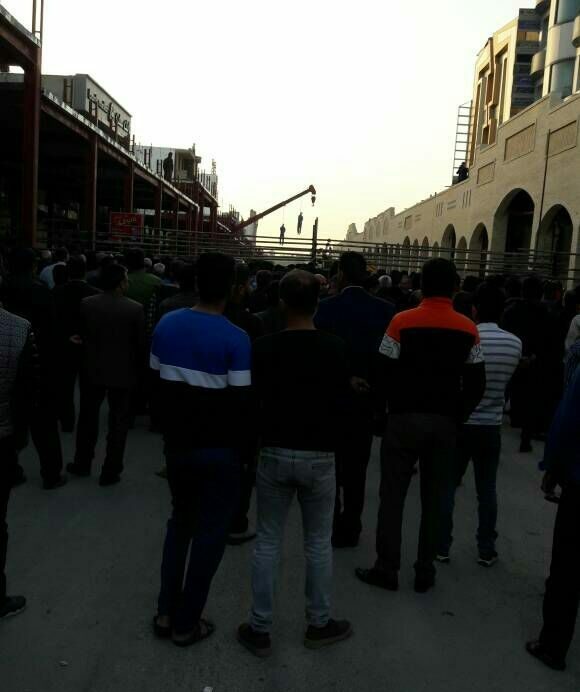 Three prisoners were hanged in a residential area in Shiraz, Fars Province, on November 21, 2018. The prisoners were charged with Moharebeh for armed robbery. “The prisoners were brought to the execution area around 7 AM with his hands tied. The area looked like parking and was surrounded by a fence making it less accessible to the public. One of the prisoners asked to do his last prayer before the execution. The authorities accepted his request. While he was praying, execution of the two others was carried out. A dozen children between 3 to 10 years old were among the crowd watching the executions along with their parents,” reported the Islamic Republic News Agency (IRNA).